The commercial qualities of the deposits around the Pit River were first noticed in the mid-1920s. 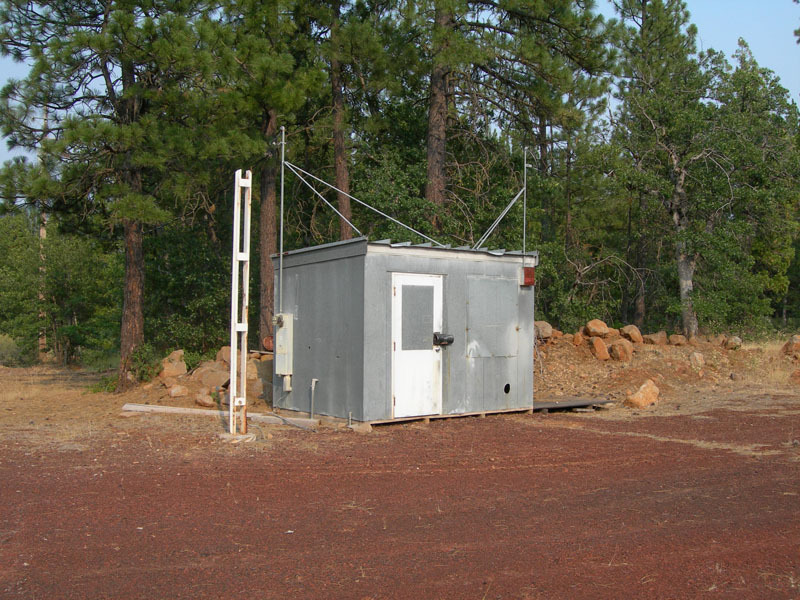 However, the remote location and lack of economically viable transportation initially prevented any development. The situation changed when Pacific Gas & Electric Company and the McCloud River Railroad built the Pit River Railroad in 1921. Carl Phelps headed a new company, the Mt. 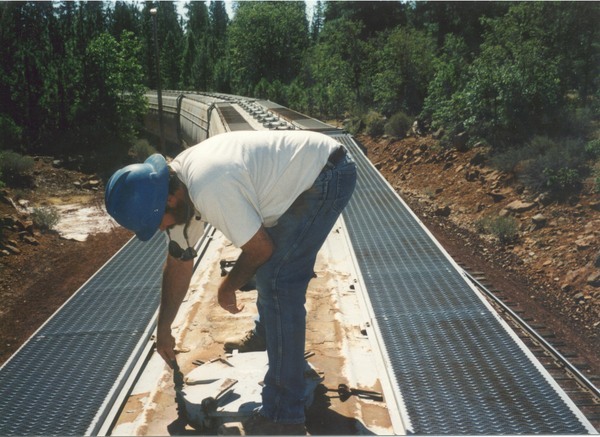 Shasta Silica Corporation, to take advantage of the transportation provided by the railroad. Mt. 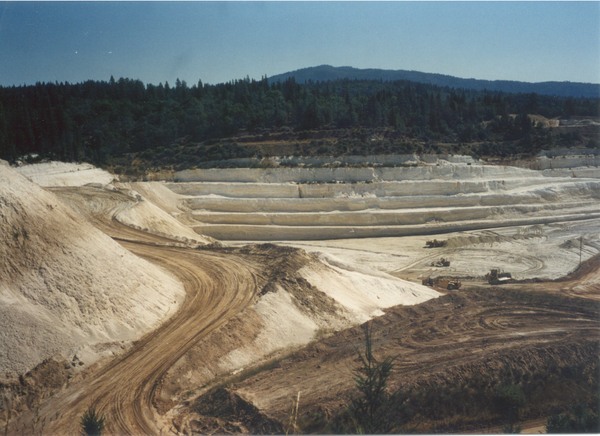 Shasta Silica performed some mining activity and shipped a few carloads out over the Pit River Railroad, but the company failed. 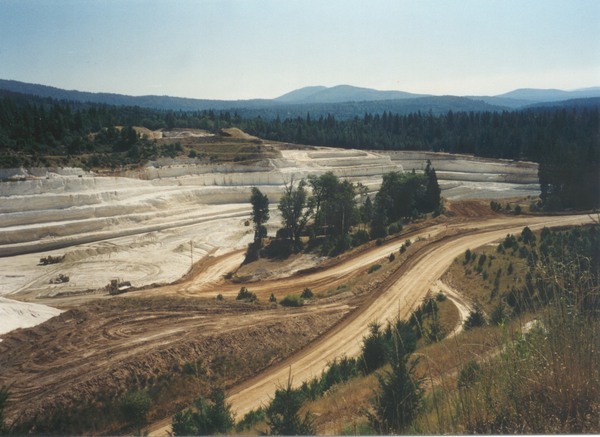 Diatomaceous earth made its next appearance on the McCloud Rails in the late 1950s or early 1960s when a small firm opened a reload at Arkrite. The railroad built a short spur, and the mining company built a small reload. This traffic lasted for only a few years, and by the early 1970s the railroad had retired the Arkrite spur. The 1970s and early 1980s saw a lot of speculation about the future of the deposits. 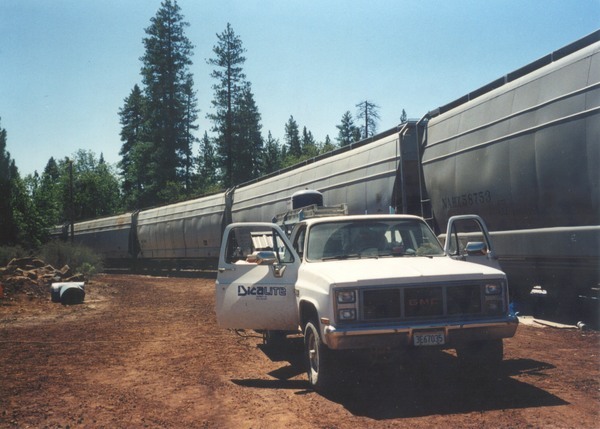 The Western Pacific marketing and economic department evaluated many proposals for shipping diatomaceous earth from the Burney area out over their railroad through the late 1970s, but the pricing policies involved in getting carloads from the McCloud River Railroad to the Western Pacific at Nubieber made this traffic cost prohibitive. Things finally started to fall into place in the mid-1980s. Dicalite Corporation, a division of Grefco Minerals, Inc., opened a new mining operation off of the north shore of Lake Britton. Dicalite become interested in shipping by rail, and negotiations became serious in the later part of 1986. 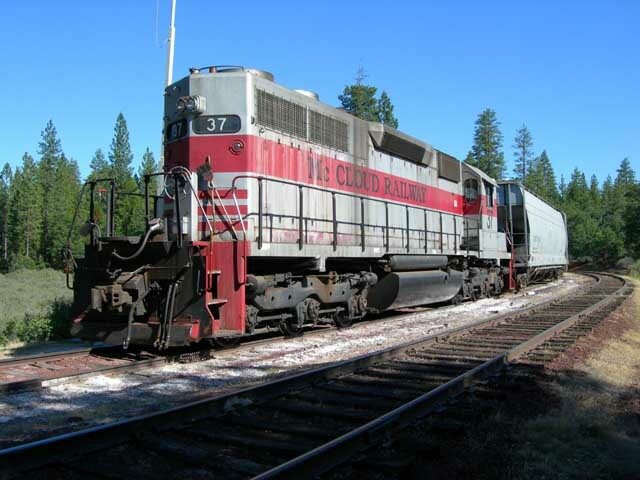 On 22 September 1986 the McCloud River Railroad operated a special passenger trains using two diesels, three leased coaches, and the railroad's VIP caboose. The special took two busloads of railroad and Dicalite officials on a tour of the line from Cayton to McCloud. The tour sold Dicalite on rail service. Dicalite became an important shipper on the railroad, and the first substantial originator of outbound loads not related to the timber industry the railroad ever had. The mining company shipped an average of 20 cars each month from Cayton, mostly in bulk form. The sporadic loads of bagged product predominately moved in the railroad's fleet of boxcars converted from all-door cars. By the mid-1990s the bagged shipments disappeared, as Dicalite moved all of this traffic to intermodal containers that left the area on trucks. 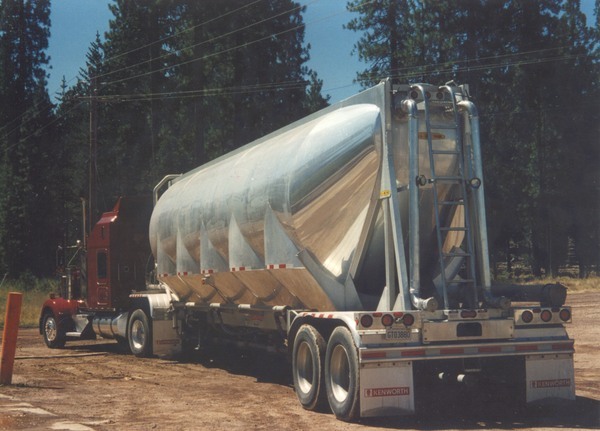 The diatomaceous earth shipped by Dicalite saw many uses, including the stone washed jeans and food and beverage industries. Approximately thirty percent of Dicalite's products were exported to customers in Japan, Korea, New Zealand, Russia, Sweden, Belgium, Germany, England, and others. 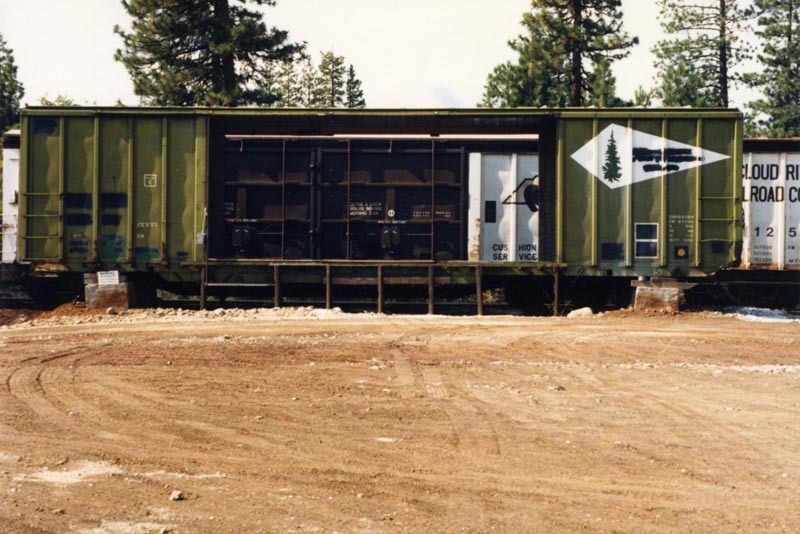 The former Camino, Placerville & Lake Tahoe boxcar placed on blocks to facilitate loading bagged product into boxcars. One of the McCloud's boxcars rebuilt from the U.S. Plywood All-Door cars is spotted for loading. Pat Driscoll photo, Jeff Moore collection. The shed at Cayton that housed the compressor used to blow bulk product from Dicalite's trucks into the covered hoppers. Jeff Moore photo. Two weeks from the end...McCloud Railway #37 parked on the siding next to the last four Dicalite hoppers spotted at Cayton that would never be loaded.